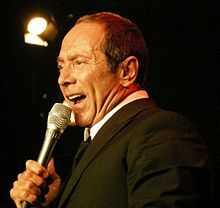 Paul Anka (born July 30, 1941) is a Canadian-American singer and songwriter. He is best known for such songs as Diana (1957) and Lonely Boy (1959). Anka was inducted into Canada's Walk of Fame in 2005. Anka was born in Ottawa, Ontario to Camelia and Andrew Emile "Andy" Anka, Sr. They owned a restaurant named the Locanda. His parents were both Antiochian Orthodox Christians in Lebanon. Anka's father and his mother were Canadian-Lebanese "from the town of Kfarmishki, in Lebanon." Anka grew up singing in the St. Elias Antiochian Orthodox Church choir. He went to Fisher Park High School where he was part of a vocal trio called the Bobby Soxers. He became an American citizen in 1990. He is married to Polish-born Anna Anka. ↑ "Paul Anka Biography". Biography.com. Retrieved 10 January 2013. ↑ "Paul Anka profile". Filmreference.com. Retrieved 2014-07-25. ↑ "Paul Anka". Encyclopedia Britannica. ↑ "Paul Anka Biogrpahy". Biography.com. Retrieved 2016-03-14. ↑ "Paul Anka profile". City of Ottawa. Retrieved December 4, 2013. ↑ "Paul Anka profile". History Of Rock. Retrieved December 4, 2013. This page was last changed on 6 January 2018, at 23:15.